Yes, more matsutake mushroom cooking, while it's still in season! 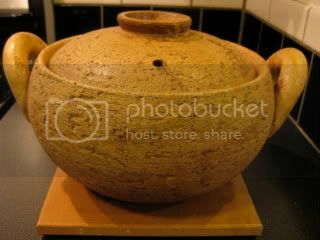 Clear matsutake soup (Matsutake Suimono, or Matsutake Dobinmushi, if it's served in a clay tea pot) is another very popular matsutake dish. 1. 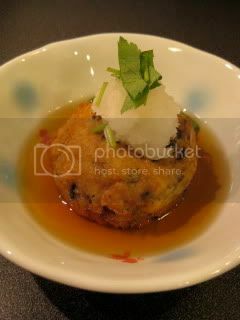 In a small bowl, combine the chicken with sake/ potato starch mixture. Mix well by hand. Keep it in the refrigerator for 15-20 minutes. 2. In a donabe, combine the dashi stock, sake, both kinds of soy sauce and bring to low simmer. Add some salt, if necessary. 3. 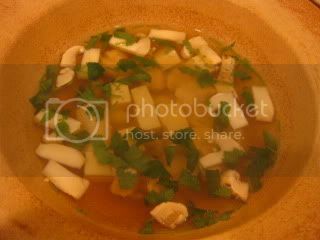 Add the matsutake, ginkgo nuts, and tofu cubes. 4. Meanwhile, in a separate small pot, boil the water and blanch the chicken tender until almost cooked through. Drain and add the chicken to the broth. 5. Turn off the heat as soon as all the ingredients are cooked through. Sprinkle mitsuta and serve at the table. I picked up more matsutake, and this time I made tempura. 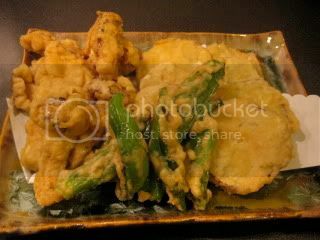 Besides matsutake, I also made tempura of satsuma-imo (Japanese sweet yam) and shishito peppers. You can find my basic tempura recipe from this posting. Instead of tempura sauce, I served the tempura simply with the plum salt (sea salt, infused with pickled plum vinegar), grated daikon, grated ginger, and lemon. They were all wonderful with the tempura. Matsutake tempura was so meaty and aromatic. Satsuma-imo was so sweet and dense. Shishito peppers had the nice light texture with the hot kick. I made Hiryuzu (stuffed fried tofu balls) the other night. People from Kanto region (including Tokyo) normally call it Ganmodoki. Hiryuzu is how it's called in Kansai region (including Kyoto and Osaka). I'm from Tokyo, but I like the sound of "Hiryuzu" (it was said to be named after Portuguese "filhos" - similar to donut, which was introduced in Japan by Portuguese in 18th century). Making Hiryuzu is not difficult, but you need to follow the process right. 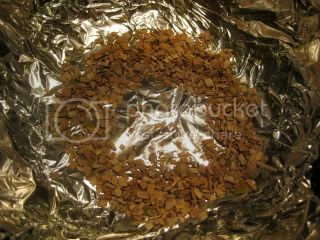 First, firm tofu (drained very well by using a weight) was mashed with mortar and pestle, and seasoning and grated yama-imo (Japanese moutain yam) was mixed in. Then, carrot, hijiki seaweed, thinly sliced gobo (burdock root) and shiso were mixed in and made into balls. 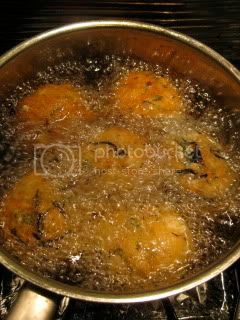 They were deep-fried in the vegetable oil until nicely golden, and served with the light dashi broth. To enjoy, I topped it with grated daikon and minced mitsuba herbs. The freshly fried Hiryuzu was so fluffy and just wonderful. 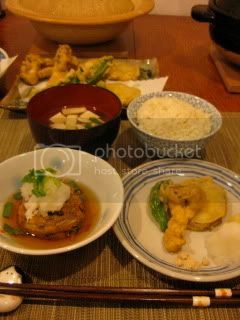 It's one of the very typical shojin (Buddhist style vegan) dishes and also very popular at home as well as restaurants (including izakaya!). 1. By using a mortar and a pestle, mash the tofu until very smooth. Add the soy sauce, salt, and sesame oil and continue to mash, followed by yama-imo and potato starch. 2. When the mixture becomes smooth, add the carrot, gobo, hijiki and shiso leaves and mix well with a spatula. Divide the mixture into 6 and form each into a round disk shape. 3. Deep fry them at 350F oil until crisp golden outside (8-10 minutes). 4. Meanwhile, combine the dashi stock, sake, soy sauce, and mirin in a small pot, and heat through. 5. In an individual serving bowl pour some broth, add each Hiryuzu, and top with grated daikon and minced mitsuba. Yes, we (Japanese people) love sushi. But, we don't normally make nigiri sushi at home. That's something we let the trained professionals make and we go out to eat them. 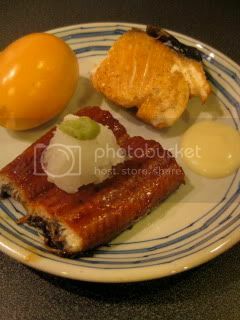 But, other kinds of sushi, such as chirashi, inari, etc., are popular to make at home. Another popular "home" sushi is "Temari Sushi". 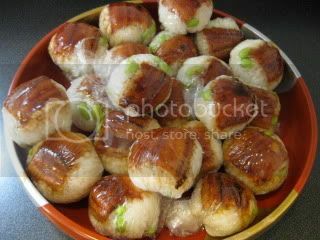 Temari sushi (sushi balls) is small sushi balls, which are great for picnic or potluck, and they are very easy to make. No special skill is required. 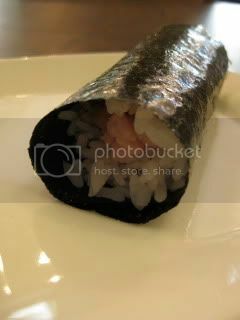 This time, I made eel temari sushi (the basic sushi rice recipe is same as eel chirashi sushi, except that, for temari sushi, rice is formed into small pieces, also eggs and pickles are not necessary in the topping). 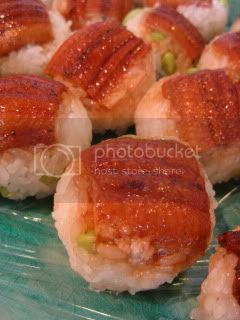 To make the sushi balls, first take a piece of BBQ eel in the center of a piece of plastic wrap, then put some sushi rice (mixed with edamame), and tightly wrap them together into a ball. I made about 20 sushi balls there. Once they are done, I just unwrapped them and arranged on a plate to serve. Isn't that easy? The sushi rice was, of course, made with the double-lid donabe rice cooker, "Kamado-san", so it was so shiny, nicely chewy, and very tasty. 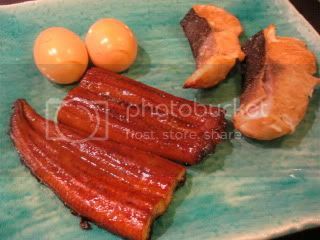 Donabe Smoked BBQ Eels...our new BIG hit! By now, we have ingredients we always like to smoke (such as duck breast, scallops, boiled eggs., chicken wings, fish, etc.) in our fantastic donabe smoker, "Ibushi Gin". 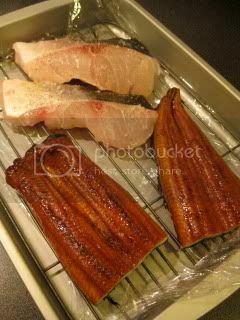 This time, in addition to our "regular" smoke ingredients, we tried BBQ eel for the donabe smoker. Sawara fish (barracuda) filets were simply seasoned with some salt and pepper. BBQ eel (in a package - make sure there is no MSG in the sauce) was cut in half. 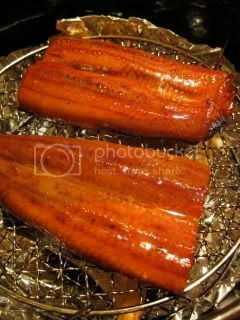 I also wiped off any excess BBQ sauce from the eel, so that the eel meat itself would be flavored with the nice smoke. They were rested (uncovered) in the fridge for 1 hour to air-dry. In the bottom of the donabe smoker, I put some sakura (Japanese cherry blossom tree) smoke chips as well as some dry herbs (bay leaves, thyme, and rosemary - coarsely ground). This time, instead of putting all the ingredients in advance, I first set the empty uncovered donabe smoker (with the smoke chips on foil inside) over high-heat of the gas stove top and waited until the smoke chips started smoking (about 6-7 minutes). Then, I put the ingredients one by one. 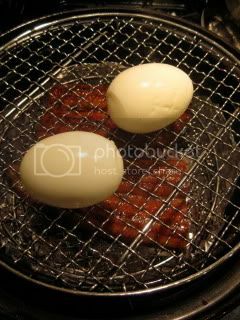 The fish on the oiled bottom grate (make sure to wipe off any excess moisture from the surface of the fish before putting on the grate), BBQ eel on the middle grate, and soft boiled eggs on the top grate. 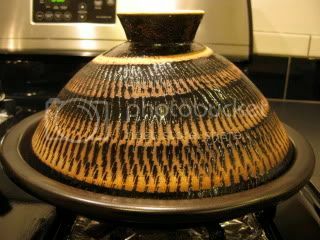 The donabe was immediately covered with the lid, the rim was sealed with the water, and let it cooked (continued high heat) for about 8 minutes. Then, the heat was turned off and the donabe was let rest with the cover on for 15 minutes. Voila, the eel got so much shinier and deeper in color. 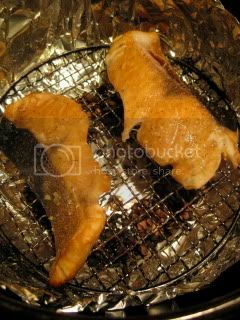 The sawara fish turned nicely smoked, too. 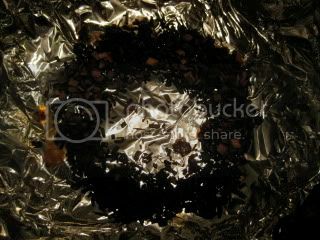 The used smoke chips were completely charred. Cleaning the donabe after smoking is very easy. I just removed the foil with the charred smoke chips from the donabe, then rinse the donabe throughly. Beautiful donabe smoked ingredients...the smokey aroma was irresistible. The smoked BBQ eel was UNBELIEVABLE!! This has become our new big hit. It was so juicy, soft, and smokey. I totally loved it with some grated daikon radish and some wasabi on top. Fish and boiled eggs were amazing, too. I served them with my Saikyo miso dipping sauce (2 tbsps Saikyo white miso, 1 tbsp mayo, 1tbsp kefir) and lemon wedges. Look how perfectly eggs were smoked without overcooking the egg yolk. I can't stop loving donabe smoking! Here's one of my regular dishes, and I would like to reintroduce. It's soybean "Gomoku-ni" (stew with different ingredients). 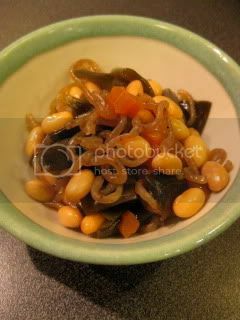 It's also a shojin (Buddhist-style) vegan dish, which is popular at Japanese homes. For this dish, Soup & Stew Donabe, "Miso-shiru Nabe", is a perfect cooking tool. Instead of hijiki seaweed, I used kelp (soft kind for stew) this time. Once the ingredients were quickly sauteed together with some sesame oil, broth was added and cooked in the oven for about 45 minutes. So, I call it Japanese "baked beans"! I never get tired of this dish...it's so complete on its own. Here's another matsutake mushroom dish I made on the same night I made the donabe matsutake gohan (matsutake mushroom rice). 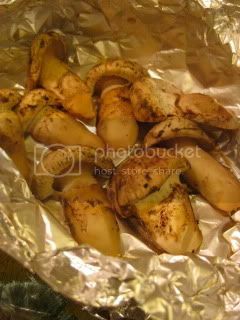 I sliced medium-size matsutake mushrooms in half and wrapped in aluminum foil (no seasoning at this point). It was then laid on the skillet of the tagine-style donabe, "Fukkura-san". 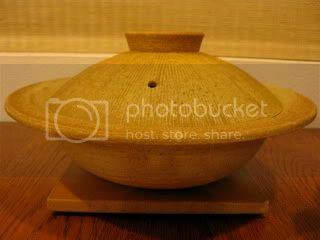 The donabe was covered with the lid and brought over high heat for 3 minutes on the gas stove. Then, it was turned down to low-medium and continued to be cooked for about 7 minutes. I opened the lid and foil very quickly and sprinkled a pinch of salt and 2 tablespoons of sake over the sizzling matsutake (at this point, matsutake was just cooked through - the cooking time may vary according to the size of the mushrooms). I closed the foil, covered donabe with the lid again, and turned off the heat. After 3 minutes of resting, I uncovered the lid and opened the foil. The simple steam-fry matsutake was ready. 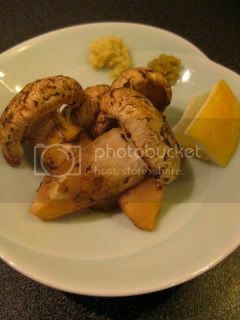 The matsutake mushrooms were served simply with yuzu kosho, lemon, and grated ginger. The aroma was just amazing. 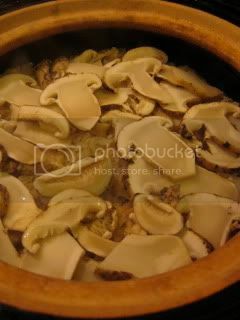 Matsutake loves the simple donabe preparation like this, and I loved it, too. Since my last purchase of this year's American matsutake, I'm going crazy about it and buy these super-seasonal mushrooms almost every day. This year has an unusually huge harvest and the price is crazy cheap. At Nijiya Market, they were only $15/ pound (later, they increased the price to $20/ pound, but still insanely cheap). I also learned that this year, people are enjoying an abundant crop of matsutake this year, too. 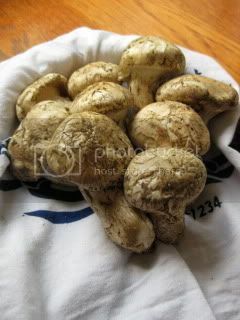 The retail price of domestic matsutake Japan this year can go between $100 - $400/ pound depending on the grades, the lower end of which is 1/10 of regular years! I hope I can eat a lot of matsutake when I go back to Japan next week. Japanese matsutake boasts the most premium quality and has the bigger aroma (very earthy and cedar-like) compared to matsutake from other countries. 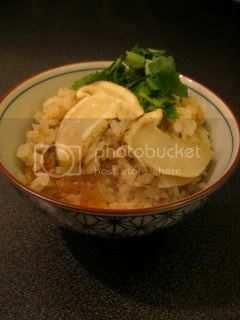 This evening, I made Matsutake Gohan (matsutake mushroom rice) with the double-lid donabe rice cooker, "Kamado-san". 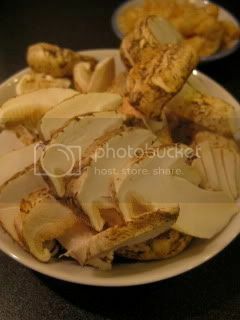 Matsutake Gohan is probably the most famous matsutake dish for Japanese people and our favorite. 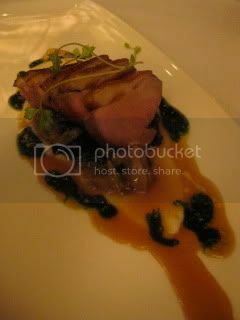 I sliced more than 1/4 pound of matsutake for this dish...how decadent! Making the dish is very easy. Also, what you want to be careful about (when cooking any matsutake dishes) is not to play too much with it. You don't want add the heavy seasoning or mix with too many ingredients. It's because we want to smell/taste the natural earthiness of Matsutake itself without masking it with other flavors too much. 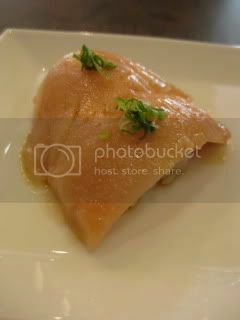 So, the only other ingredient (besides seasoning) I used for the dish is thinly sliced blanched abura-age (fried tofu pouch) for its texture and gentle flavor. When the rice was ready, the aroma was indescribably wonderful. I would've also sprinkled some yuzu zest, but I didn't find a good yuzu at a market. So, I simply topped the rice with some chopped mitsuba herbs. The dish totally hit my heart and soul. The "okoge" crust was perfect, too. Here's the recipe. 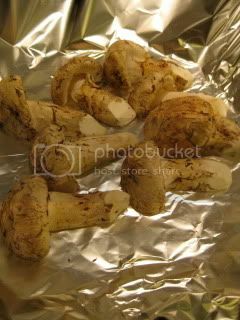 *To clean matsutake, use a damp paper towel to wipe off the dust. Shave off the very thin layer of the hard bottom part. 1. Rinse and drain the rice. 2. Combine the rice, sake, soy sauce, mirin, salt, and dashi stock in "Kamado-san". Let stand for 20 minutes. Cover the rice with the sliced abura-age and matsutake. 3. Place both lids on "Kamado-san", so that the holes of the lids are positioned perpendicular to each other. 5. Turn off the heat and let it stand for 20 minutes. 6. Toss the ingredients with a spatula. Serve the rice mixture into individual bowls and top each with chopped mitsuba and yuzu zest. 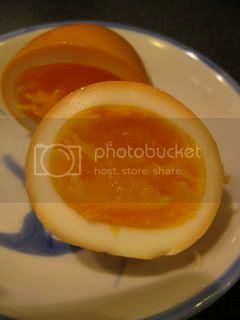 I also posted the recipe on toiro's website. Here's another classic Japanese dish. 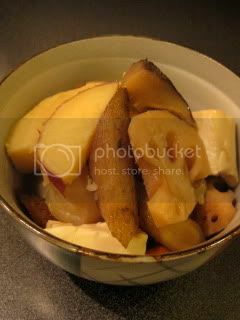 "Chikuzen-ni" is a stew of root vegetables and other ingredients. It often includes small pieces chicken thighs (chicken adds the deeper flavor). This time, I made the shojin (Buddhist vegan) style Chikuzen-ni with the shojin dashi stock (infused with dry shiitake mushrooms and kombu). So, there is no chicken, but the dry shiitake and root vegetables gave the very nice complex flavors. To make this stew, I like using my Soup & Stew Donabe, "Miso-shiru Nabe", which has the very thick body and makes the wonderful stew or slow-cooking dishes. You can do a combination leftover ingredients. This time, I used satsuma yam (Japanese sweet potato) and also added some leftover soft tofu at the end. 1. Drain the lotus root and gobo out of the water. 2. 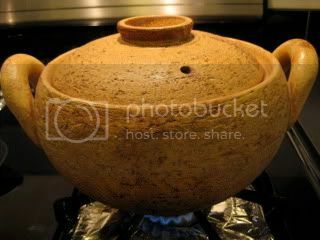 Heat the sesame oil in Miso-shiru Nabe, and saute the lotus root, gobo, carrot, konnyaku, and rehydrated shiitake for 2-3 minutes. 3. Add the dashi stock, sake, sugar, and mirin. Add some saved soaking liquid for shiitake (if necessary) so that the liquid covers more than 2/3 of the ingredients. Bring to a boil, and reduce the heat to simmer. 4. 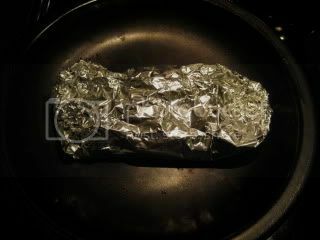 Place a piece of foil on the surface of the ingredients. Cover with the lid. Simmer for 10 minutes. 5. Drain the satsuma yam and add to the pot. Add the soy sauce. Put the foil and lid back on and simmer for additional 8-10 minutes. 6. Uncover and add the tofu (scoop out bite size pieces by a spoon). Cover again with a lid. 7. Turn off the heat and let it rest for 15 minutes. Serve into individual bowls and sprinkle some shichimi peppers (optional). *The stew will taste even better after 3 hours. You can enjoy at room temperature or reheat it. "Shira-ae" is a very popular dish in Japan. It's basically vegetables, tossed with creamy tofu paste. I got kabocha pumpkin and haricot vert in the fridge, so I made a quick shira-ae with these ingredients. I tweaked my regular recipe, and made it with the silky tofu and also added a little kefir at the end. So, the tofu paste was really fluffy and nice. 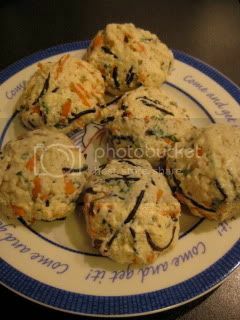 (If you want to make vegan style, you can do without kefir.) Here's the recipe. 1. By using mortar and pestle, mash the tofu to a fine paste. 2. Add the sesame seeds, soy sauce, sesame paste, agave nectar, and kefir, one by one and mash with the pestle each time. Add some salt if necessary. 3. 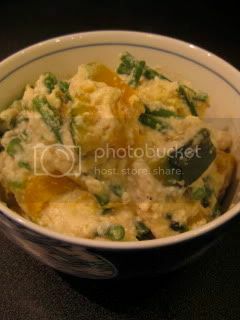 Add the kabocha and haricot vert and mix by a spatula. 4. 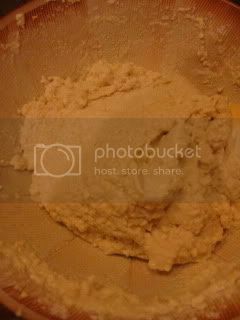 Transfer the mixture to a serving bowl. 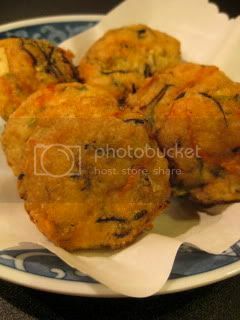 "Shira-ae" makes a wonderful appetizer or side dish. At home with a friend...2007 Petra Unger, Gruner Veltliner, Gottschelle DAC Reserve (Kremstal, Austria). The vineyard name "Gottschelle" is an old expression of "good soil". Classic Gruner aroma with the exotic fruit and white pepper. Quite rich on palate. 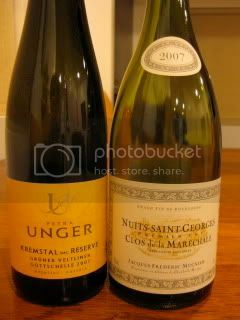 2007 Jacques-Frederic Mugnier, Nuits-Saint-Georges 1er Cru, "Clos de la Marechale"...still at its youth. Beautiful and poweful "Nuits" character with the rich meaty texture and a hint of coffee. Dinner at Pizzeria Mozza. 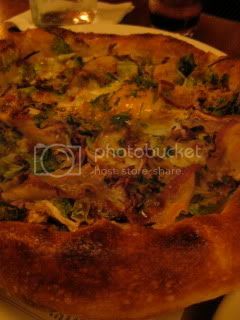 My favorite dish of the night was the pizza of Egg, guanciale, escarole, radicchio and bagna cauda. Egg was so nicely runny and all the flavor combination of bitter vegetables, cheese, and bagna cauda sauce was just perfect. 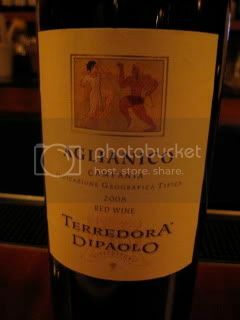 The pizza was really nice with 2008 Terredora Dipaolo, Agrianico (Campania, Italy). The wine had the nice dense fruitiness. Restaurant was packed as always and it seemed almost like 80% of the crowd was Asian people (including myself)...there is something about Mozza and Asians?? Wednesday night was live jazz night at Palate Food + Wine. The music was fantastic, the food was especially nice this evening, and the wines were really great. We ordered so many dishes and got so full. 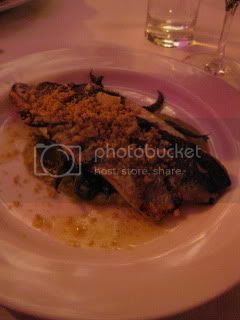 I enjoyed Blanzino with broccoli 2-way, pine nuts, and bagna cauda (again!). 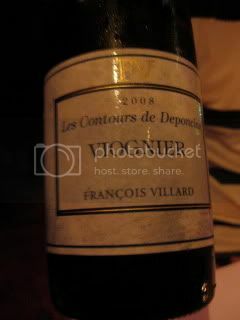 2008 Francois Villard, Les Contours de Deponcins, Viognier...from the young vines of Condrieu (so it carries VDP appellation). Very rich aroma of tropical fruit. Fresh and young. 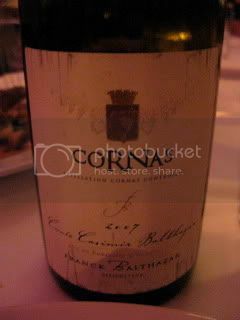 2007 Franck Balthazar, Cornas, Cuvee Casimir Balthazar...outstanding! As soon as I put my nose in the glass for "tasting", I sighed with excitement. The wine didn't even need to be decanted. So elegantly aromatic (with rose, perfume, fig, spices). Rich and smooth on the palate. Dinner at Hatfiels...I did their Seasonal Prix Fixe. 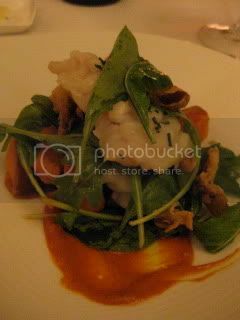 My dishes were Monterey Bay Squid Salad (Mint, watercress, lime, Urfa Biber creme fraiche), Steamed Skate Wing Salad (picture....Wild greens, fried maitakes, garnet yams, harissa), Pan Roasted Duck Breast (picture...Caramelized endive and cherry, pistachio pistou, celery root puree), and Goat Milk Cheese Cake. Everything was so carefully prepared to the details and I was really impressed! I ate everything...we even ordered a side dish of Brown Butter Roasted Cauliflower, which was very nice also. 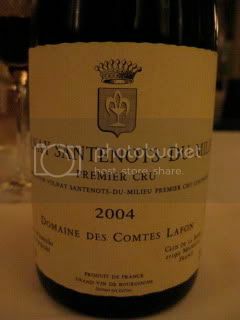 Duck was great with 2004 Domaine des Comtes Lafon, Volnay Santenots-du-Milieu 1er Cru. Wine was still tasting young, yet it was so classic and elegant with the tea smoke, dark berry, and earthiness. Lunch at Sugarfish Sushi in Downtown, which is a newly opened location of Sushi Nozawa's franchise. I did "Trust Me/ Lite" (edamame, nigiri sushi of tuna, albacore, salmon, and shrimp, and toro hand roll). I also ordered albacore belly (today's special) sushi as an extra. Very modern-style space. All the sushi is made in the back kitchen to order. I got nicely full.